If coconut sugar has only just popped up on your radar, you’re not alone. Here at Shared Kitchen, we’ve really taken to it, but on researching I was surprised to find no mention of it in any of my culinary tomes, yet, supposedly, it has been used as a sweetener for thousands of years in the main coconut-growing regions of the world, the Philippines and Indonesia. I’m no expert, but here is what I know: we love it because it tastes strangely earthy, caramelly, faintly bitter, raw and natural, as if it has hardly been processed. It smells a bit like a burnt coconut husk, if you’ve ever smelled such a thing (just imagine it if you haven’t! ), sort of a bit like burning car tyres mixed with fragrant wood embers, or like a hangi dug up (earth oven). Take your pick. It’s illusory anyway, and it depends on the brand! 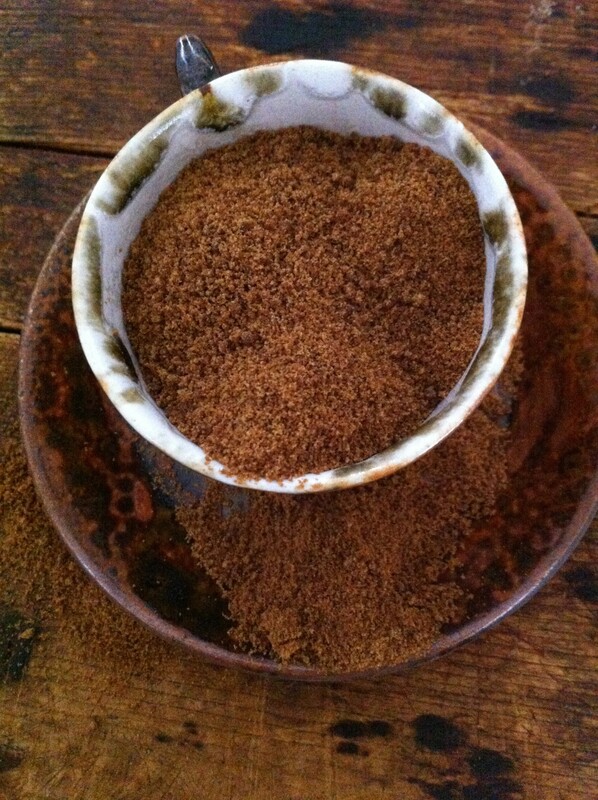 Coconut sugar is made from the sap harvested from coconut palm flowers. It’s then boiled up to evaporate the watery content. Unlike stevia, which I do not use, the taste is initially sweet and caramelly, then it becomes complex, slightly bitter only to finish pleasantly sweet. Stevia may be better for you than sugar but I can never wash away its clinging sweetness, even after 3 hours and a litre of water! Yuk. Yep. It’s not my bag. Coconut sugar does it for me if it’s sugar I am after. It’s got a lot going for it – potassium, zinc, iron and magnesium, and plenty of B vitamins – but, and this is a BIG but, it is primarily sucrose with a similar calorie count as sugar, so treat it as a sugar and don’t guts up on it! (Ilaria, put that spoon down!). It’s a slightly healthier alternative to white sugar because of its minerals and vitamins and it is also lower on the glycemic Index. That’s great, and it’s most certainly less processed than regular white sugar. But it costs more. Get some and try it out with Ilaria’s Chia & Coconut Dessert.